Netizens slammed anti-Duterte journalists for twisting the president-elect's statement on media killings during a press conference. In his response to a question regarding murdered journalists, the incoming head-of-state blamed corruption and biased reporting. Kung papatayin ka talaga papatayin ka. There is no way to know that the next victim would be a journalist. Sa karamihan, prangka-prangka, may nagawa yan. Kasi hindi ka naman talaga papatayin diyan kung wala kang ginawa. Yung mga expose or bad words against us, wala yan. Ako I’ve been mayor… Pero karamihan niyan may, alam mo na, nabigyan na especially if you want to take sides. Nabayaran mo na tapos you play. Yan ang karamihan na namamatay. Or tumatanggap na sa mga sugarol, tapos binabaril. You really want the truth, yun ang truth. There is still corruption sa inyong side. Marami yan. Hindi lang ang binibigyan niyan hindi lang ang pulis. Yung si Pala (Jun Porras Pala), binibigyan yan, kokolekta harap-harapan sasabihin kumolekta kami tapos sa kabila, babanatan mo. Ayun, that is the best example of bakit namamatay itong mga journalists. Ang prangka-prangka. Karamihan ganun. Kasi kung journalist ka lang na tao, walang gagalaw sa iyo especially if it is the truth but you cannot hide the truth. Pero yung ganun. Ang example natin dito, taga rito ka man, iyong si Pala. I do not diminish his memory, but he was a rotten son of a b**ch. The National Union of Journalists of the Philippines (NUJP) called Duterte's statement "appalling," Rappler reported. Mr. Duterte's crass pronouncement not only sullies the names and memories of all 176 of our colleagues who have been murdered since 1986, he has also, in effect, declared open season to silence the media, both individual journalists and the institution, on the mere perception of corruption. The NUJP admitted that there is corruption in Philippine media. The Reporters Without Borders, or Reporters Sans Frontières (RSF), a global press freedom advocate, urged journalists to boycott Duterte's press conferences. Not only are these statements unworthy of a president but they could also be regarded as violations of the law on defamation or even the law on inciting hatred and violence. RSF also called for legal action against the president-elect. Duterte should nonetheless be pleased by the existence of these laws because without them he would also be exposed to violent repercussions, according to his own words. We urge organizations that represent the media to not overlook comments of this kind and to bring lawsuits. We also urge the media to boycott the Duterte administration’s news conferences until the media community gets a public apology. The expected headlines aside from the new cabinet members would have been the declaration of war against red tape and the unnecessary burden and fees imposed on hapless citizens. Yet, national and international media lapped up on the issue of media killings. Again and as usual Rody Duterte was taken out of context, misinterpreted and misunderstood. For instance, his example of most slain journalists as being corrupt or involved in shady deals was based on his own assessment of those killed in Davao City and not on the national scale. Certainly, Duterte has no personal knowledge on each and every single case of media killings in many parts of the country. During the election campaign, Duterte has stated he would create a Task Force to address media killings and ask for a special prosecutor to focus on these cases. I repeated the same stand when I joined members of the National Press Club (NPC) visit the wake of the most recent victim of media killing, Alex Balcoba, last Monday night. When Duterte said last night that journalists become vulnerable to killings, it was because they were no longer seen as fair and neutral members of the media but because they have become partisan propagandists, deliberately using their media outlets in attacking or defending one party or another and collecting pay offs on both. In the context of Duterte's campaign against corruption, his remarks indeed should be seen to mean a reminder or a message that there are also corruption in mass media. And he has seen this during the recent election when headlines, for instance, were being bumped off to give way to paid black propaganda masquerading as news items. Hence, he said you really want the truth? well that's the truth. Earlier, Laviña said the Duterte administration will create a taskforce that will focus on and resolve media killings. Meanwhile, netizens who became Duterte's social media warriors during the campaign period defended the incoming president against corrupt and biased journalists. I think Duterte is trying to piss off the media. Thats his style. He leaves out innuendos and double meanings to see how people react. He toys with people's emotions to see how defensive they become. Thats his way of exposing your character. Will you be weak enough to take it personally? Guilty enough to be defensive? Stupid enough to get angry? Or wise enough to figure it out and take his words with a grain of salt. Its like chess. He sends out pawns and if you go after them, he will learn so much more about your motives. Word of advice. Don't be too literal. Discrediting the media is a strategic move. So people will not depend on the media to think for them. So we Filipinos will learn how to think on our own. Without having CBCP, the Church, or the media to influence and manipulate how we should lead our lives. We're dealing with a high level thinking mastermind with a very complex thought process and if you are too simple and onion-skinned, you obviously cant keep up with him. Im not sure why i understand the language of men so much. Maybe its a bisaya thing. Maybe we are a different breed. Or maybe, we breathe fresher air down south so our minds are way more open. Then i watch people in Manila throw rallies regarding just about anything that they cannot accept and comprehend. What is wrong with what he said? 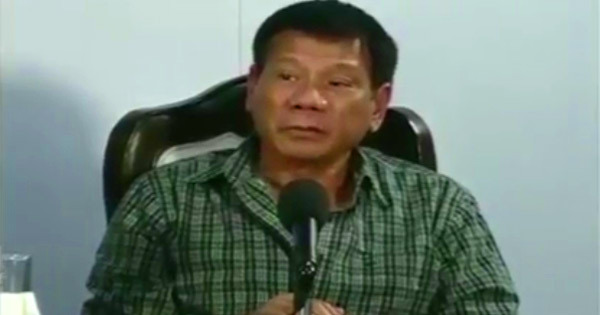 He simply explained why journalists in the Philippines were killed. And it is the hard truth, there are a lot of paid journalist around the country. Some were killed by the people they attacked and some were killed by the people who paid them to attack. Of course, there were others who paid life by doing their job honestly and that is the sad part. Anyhow, ok, fine, let the media boycott his press briefings, we the people can always get Pres. Duterte's message via social media straight from his mouth, no colors, no misinterpretation. Let us see who is going to lose. I thought it was not true that some journalists would do ACDC or "Attack,Collect; Defend,Collect". But when I got married to a public official whose tenure of political life was marked by commitment in excellent government service and a direct saying no to corrupt practices that I would witness and get to know them in person. They would sometimes harass us by knocking at the window of our room when my husband Jun and I would not open the door for them as we have no extra money to give them. If you don't give them money,they will not stop attacking you on baseless complaints and will only give you airtime if you pay. These journalists, only a handful, are truly present and they are one of those that a politician must feed so they will publish good story and for a good price, they will attack political opponents beyond the bounds of professionalism. President-elect Duterte knows this of course and honestly I feel so relieved that a politician in power and yes an incoming president at that can tell this truth, courageously. President Duterte is going to be the biggest victim of bad journalism, I rest my case. Instead of writing articles and using media platforms which will unite the Nation, cheap writers choose this specific topic which was taken out of context. Watch the video and find the word or thought that "Endorses Media / Journalist Killing" or him "Condoning Media / Journalist Killing"... He stated what and how things are happening now. Let me personally state I do not support extra judicial killings of any kind, summary or mass killings. I believe in due process too. But let's assess what kind of person our President is, he's a realist and he'll say things as is, not to sugar coat but to expose truths that will sting because it's happening everywhere. We do not elect leaders to feel good. They're there to present pressing national problems and find ways to address it. If you're looking for a Pope, go to Vatican. But because not many listen and comprehend full videos now a days, I have cut the clip regarding headlines being published today by the Mainstream Media. I refuse to believe headlines and articles anymore. Today has just been a classic case of people believing hearsay & scrolling through headlines, as usual. With the attention span of people like birds, I'm not surprised how it's been handled online and on television. Although, keep discussing about it until the standard of journalism get's better. And if you know someone who accepts bribes for articles, expose them. Duterte is not the media's favorite person - I can see why, his broken statements seem to give them a hard time to write any "juicy" story, so they make stuff up instead. So at this point, the people themselves need to dissect further. My UP Diliman professors were right, a lot of the problems stem from journalists who write notes too fast just to write the story rather than LISTENING before writing - and of course, there are people who read sensationalized articles and react like as if they were proven right..
NEVER BELIEVE HEARSAY, always listen to FULL STATEMENTS. The discussion was a very specific case (JUN PALA), and the example cited was very specific to why these killings happen today, a practice that has to be controlled by the Duterte Administration. It was never ENDORSED or CONDONED. Where in the video do you hear that he condones such an action? But he cites that it's a reality TODAY and WHY it happened to certain journalists. It's called premise, my friends. It's a DISCUSSION ABOUT A SPECIFIC TOPIC, not a GENERAL action he has and will condone(s). What a circus.